It’s that time of year again. The time of setting New Year’s resolutions—or not. Since I belong to a gym, I approach January 1st with mixed feelings. On January 2nd, I know that my gym will be overrun with hordes of new members. They will fill the parking lot, take up locker space, and wander aimlessly around the exercise floor, as they struggle to master the nuances of the pec fly machine and the StairMaster. The New Year’s resolutions members, we call them. Roughly half of them will be gone by Valentine’s Day. By the Ides of March, two-thirds will have fallen by the wayside. By Tax Day, they will be a shadow herd, less than ten percent of their original number. This is, to a major extent, how fitness facilities make their money: They sell scores of memberships that go unused after a few months. The owners of every gym know that the year-end, that time of New Year’s resolutions, is the prime time for such sales. Because so many people make New Year’s resolutions that they quickly abandon. This raises a natural question: Are New Year’s resolutions even worthwhile? Or should we go into the default mode of post-modern cynicism, and assume that New Year’s resolutions, too, aren’t what they’re cracked up to be?…Another residual cliché of a bygone age. Yes, New Year’s resolutions do have a notoriously high failure rate. And yes, the New Year’s resolution has become something of a cliché. I’m going to submit to you, however, that the New Year’s resolution is still a very worthwhile undertaking. Consider the significance of January 1 as a juncture for clearing the decks, hitting the reset button, starting over. The first day of January is a completely arbitrary date, from a scientific, mathematical perspective. Theoretically, you could start afresh on any day of the year. Why not March 10th? Or May Day? Or Thanksgiving? The entire world has earmarked January 1 as a new beginning. The way we designate time subtly changes, as the year is altered by a single digit. The New Year is hyped in the media, and practically everywhere else. I’m often a cantankerous contrarian. But even I know when to go with the flow. Even though you could theoretically start afresh on any given day of the year, there is a great deal of cultural momentum behind New Year’s Day. Why not use it in your favor? New Year’s Day, in fact, has a semi-spiritual status in some Asian cultures. The Japanese celebration of Christmas is purely secular (Christians are a small minority in Japan); and the Japanese don’t recognize Hanukkah at all. But the New Year bears a special significance within the animist beliefs of Japan’s native Shintoism. In Japanese corporate settings, there is the bonen-kai, or “forget the year party”. Held in late December, these are occasions for putting the previous year firmly in the past, so as to facilitate a fresh start in the New Year. New Year’s Day in Japan is a time for visiting friends and loved ones—much like Christmas Day in the West. Speaking of corporate settings: Even though many companies end their fiscal years on October 31st or July 31st for accounting purposes, most use the New Year as a time to rally employees, suppliers, and customers for a new set of goals. Why not do the same, at an individual level? New Year’s resolutions become more important as we grow older. Children, teens, and very young adults rarely set New Year’s resolutions, and with good reason. Their lives are already focused on change and transformation. When you are in school, after all, there is a natural progression built into the transition from one grade—and from one major level of education—to the next. Your life is going to change whether you want it to or not. The process is going to kick you forward. The setting of new goals, likewise, is built into the process. Many of these goals are predetermined. You don’t really have a choice about the goal of moving from the fifth grade into the sixth, or graduating from high school. As an eighteen year-old high school graduate, you’ve got to do something next. If you’ve been blessed with caring parents and other conscientious adult authority figures, you’ll have no shortage of advice. But either way, you can’t remain in high school. The only way to go is forward…toward something. After we become entrenched in the adult world, however, that systemic forward progression no longer pushes us along. In its place arises an inertia that encourages us to fall into ruts. The external trappings of this year might not vary much from those of the previous year, or the year before that. Change is quite often something that has to be initiated from within, versus accommodated from without. And this is how we get “stuck”—in any number of ways. I recognized signs of this pitfall in my own life in the mid-1990s, as I passed the midpoint of my twenties. I was five years removed from college, and about ten years removed from high school. I was just another working adult, and I could already sense myself falling into ruts. 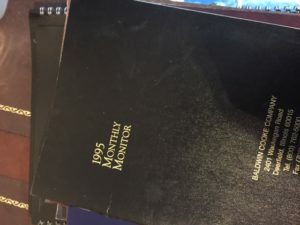 So in 1995, I began two new habits. The first of these was the setting of annual, quarterly, and monthly goals. I set goals in all areas of my life: financial, physical, social, professional, and “skills” (areas of knowledge that I wanted to improve or acquire). I also began keeping a daily record of my activities. Nineteen ninety-five was still a largely analog world, so I used a paper-based system: I acquired a “business diary”, and used this for my daily records: accomplishments, setbacks, challenges met and overcome, memorable events, etc. Nothing fancy or too elaborate. Just something to give me a bird’s-eye view of the year the following December, when it would be time to set the next year’s goals. I’ve been following this practice for twenty-four years now. I still have my 1995 diary, as well as my diaries for all the years in between. It’s interesting to see how my goals and priorities have changed since the Clinton era. I’m naturally nostalgic (most conservatives are); but you don’t have to be obsessed with your personal auld lang syne in order to benefit from such a system. It is as focused on the future as it is on the past. And the pivotal day of that system is New Year’s Day, January 1st, when I set aside one diary and open a blank one. All those pages—twelve months of time. A lot can happen in a year. A lot can be accomplished in a year. That is as true for me today, at age fifty, as it was on January 1, 1995, when I was twenty-six. But at age fifty, I probably rely more on this tangible reminder of what the New Year means. That word tangible is important, by the way. I would encourage you to record your annual plans (and results) in a written, paper format. I know: iPhones and Word files and “the cloud”. Fiddlesticks. Holding a year in your hand, in a single bound document, makes that year more psychologically substantial. This will be true on both January 1st and December 31st. And it’s definitely true later on, when you’re looking back on long-past years. Use a physical diary to both plan and record your personal year. The past 24 years of my life. Back to the gym. I know that the bulk of the New Year’s resolution members will come and go by March 15, because I’ve seen them come and go so many years in the past. Likewise, I have fallen short on many of my New Year’s goals. So will you—unless you set goals that are unambitious (and therefore, uninspiring). That said, the past twenty-four years have taught me that my New Year’s planning has a direct and proportional impact on the success of each subsequent year. This is why I maintain the practice, and probably always will, until the day when my New Years are no more. Previous Previous post: ‘Revolutionary Ghosts’ updates!